For years the do-it-yourself (DIY)/punk underground has worked against the logic of mass production and creative uniformity, disseminating radical ideas and directly making and trading goods and services. But what happens when the underground becomes just another market? What happens when the very tools that the artists and activists have used to build word of mouth are co-opted by corporate America? What happens to cultural resistance when it becomes just another marketing platform? 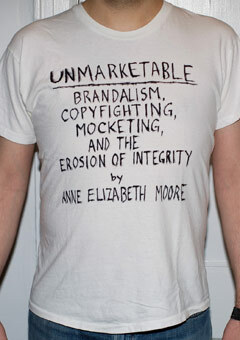 Unmarketable examines the corrosive effects of corporate infiltration of the underground. Activist and author Anne Elizabeth Moore takes a critical look at the savvy advertising agencies, corporate marketing teams, and branding experts who use DIY techniques to reach a youth market—and at members of the underground who have helped forward corporate agendas through their own artistic, and occasionally activist, projects. Covering everything from Adbusters to Tylenol’s indie-star-studded Ouch! campaign, Unmarketable is a lively, funny, and much-needed look at what’s happening to the underground and what it means for activism, commerce, and integrity in a world dominated by corporations.